Three years ago, Imran Sheik came up with a script for a story about an intelligent lawyer with an eidetic memory. He then made this into a legal thriller short film and ended up calling it Jibril. The film received positive responses throughout his university campus in UiTM, and eventually it inspired him to incorporate the theme of the film into a new eatery he was opening. The eatery shares the film and main character’s name, whereas the overall design of the cafe was laid out to evoke the feeling of customers stepping into Jibril’s lair as in the film. Classy yet mysterious, just like the eponymous character. Think of 1920’s Great Gatsby, and you have the look right down pat. Jibril is a speakeasy bar restaurant located in SS15, Subang Jaya. 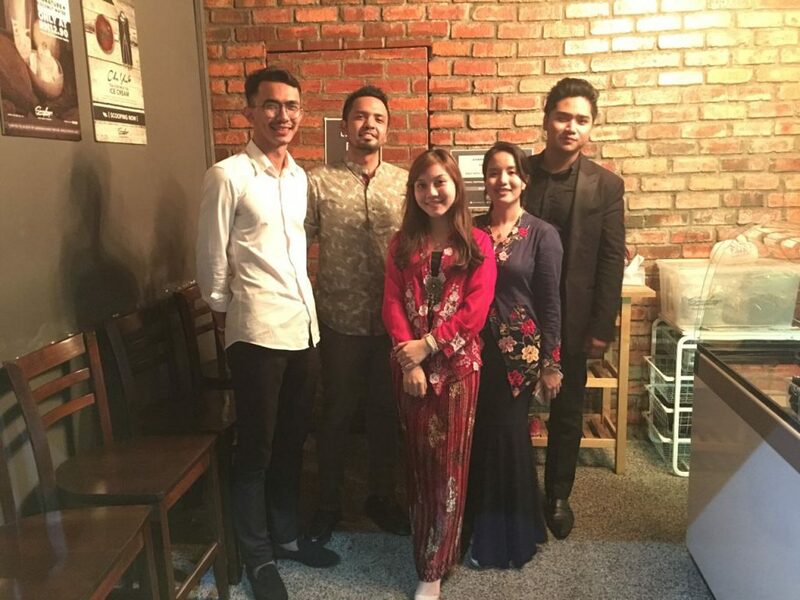 The idea of opening an eatery originally started with Imran who then conveyed his intentions to his partners, Nurin, Akmyr and his high school friend Atiqurrahman Sulaiman. They weren’t complete strangers to the F&B industry; Imran and Nurin were already running a Sangkaya outlet in SS15 Subang. This outlet was originally just a small stall in Kapten, a steamboat restaurant located near the area. The demand for the ice cream increased significantly early last year which then prompted them to then move to another shop lot. When they were able to secure a strategic location, Imran expressed to Nurin his desire to open a speakeasy cafe while running the Sangkaya business at the same time. “Of course, she thought that I was crazy. The crazier thing was the period between when I told her that we should open a speakeasy café and and to our first day of operations was just 1 and half months,” said Imran to Vulcan Post. It was a short time, but it’s a testament to their determination and focus that they were able to move from conceptualising the idea towards the physical reality in that period. 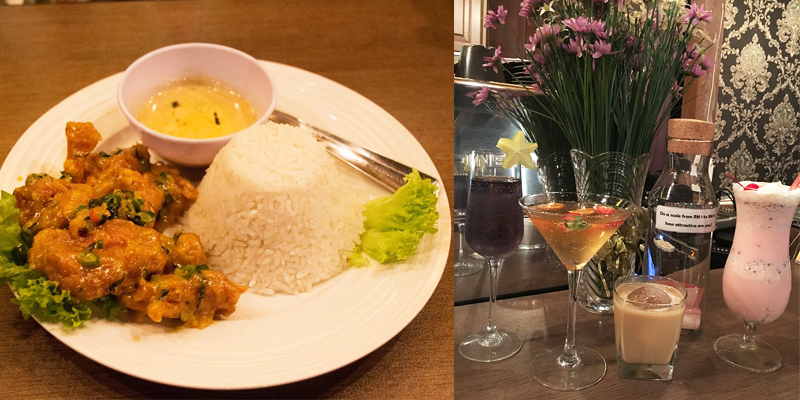 L-R: Signature salted egg butter chicken; an assortment of their mocktails. When going to Jibril, there are two things you’d need to have in mind: their signature dish of salted egg butter chicken as well as their mocktails. “The salted egg butter chicken is definitely our most famous dish, since it’s also accounted for 70% of our revenue. It’s amazing how many people enjoy it but we’re glad it’s become sort of a symbol to our cafe,” said Imran. But before you can taste these delectable dishes yourself, just finding the place proves to be a challenge. My first experience with Jibril involved me looking around for something that was actually right in front of me. The design of the door is made to look like a brick wall as Imran shared how he wanted the overall aesthetic to resemble a true speakeasy bar. “When I was 13, I had chronic migraines. One of the things the doctor told me is to be in places that are quiet, cold, and dark. I noticed that whenever I’m in a place that has these three things, I feel really calm. A couple of years ago I discovered speakeasies, both in our country and abroad. And I really enjoyed being there. I’m a firm believer of creating products where you yourself want to be the customer,” said Imran. Another reason why the team decided to go for the speakeasy concept was because they realised how strong the influence of referrals from their customers could be. “Almost half of the customers we talked to came to our café because their friends kept telling them about this ‘secret café in Subang’. People love to talk about the secret door between the walls. I mean, if our café has the same ol’ hipster setting, what’s there to talk about?” said Imran. Another key factor that Jibril has is their mocktails with unique names and unique tastes. Imran, being in charge of the creative side of the business, was very particular when it came to naming the products and their various associations. “All of the mocktails represent people that I admire. There’s also some degree of connection of the name to the flavours of the drink. For example, Kurosawa is our cherry based mocktail. It’s inspired by one of my favourite filmmakers Akira Kurosawa (who also inspired George Lucas to create Star Wars). The connection is the cherry blossoms that are prominent in Japan,” said Imran. Among the 4 of them, though they all help with the management, Akmyr plays the role of the managing partner, while Imran and Nurin balance handling Ombré, their fashion styling app, and Jibril. Imran contributes to the creative side, like choosing the songs for the playlist, recipes for the food and beverages, and marketing. “The inception of Jibril in a sense was easier because I can totally focus on the business, although I was still studying that time, I was focusing 100% on F&B business not tech startups. But it was a different story when Ombré was founded, because Jibril was still operating,” said Imran when asked about his experience balancing two businesses at once. Though he spent a lot of his focus onto building up Ombré, he now aims to bring his attention back to developing Jibril further. He doesn’t see balancing two businesses as a major chore; in fact, he enjoys it. “I think managing Jibril in some ways will help me and Nurin to administer the operations in Ombré. In F&B, cash flow is of the utmost importance. Managing employees is also a key. Since Ombré is still in the pre-revenue stage, these skills that we learnt from managing Jibril can be used to manage the finances of Ombré when we start to make money,” said Imran. According to him, on an average they get around 7000 customers a month. He’s not complacent and ready to rest on his laurels though. “It’s the tough reality of F&B that even in SS15 alone there are many cafés closely packed together. We’re grateful that we can be profitable, ” he said. But though the success may bring happiness, it’s the moments people personally go up to him and tell him how special Jibril that he appreciates more than anything. “I really love when the customers love the product and can explain the values of it. I understand some business owners just want to leverage of the market’s spending without consideration of the product’s value. But for me, customers that buy valueless trending products might not stick long. They’re in it for the hype, not for the brand’s value,” said Imran. In the future, Imran hopes to introduce more items in the menu while also expanding it to other places but keeping its novelty. After all, they don’t want to lose the unique core essence of Jibril.